The Ithkuil system of numbers and counting is distinct from Western languages in two fundamental ways: it is centesimal (base one hundred) as opposed to decimal (base ten), and the numbers themselves are full formatives (i.e., nouns and verbs), not adjectives. This has already been discussed briefly in Section 4.5.1 regarding the PARTITIVE case. This section will examine the numerical system in greater detail. Being a centesimal system of enumeration, the numbers from zero to 100 are considered autonomous units represented by single stems and written using single autonomous symbols. Beginning with the number 101, numbers are referred to by the number of hundreds plus the number of units, just as a decimal system, beginning with the number 11, refers to the number of tens plus the number of units. However, where a decimal system then shifts to a unit referring to 100 once “10 tens” is reached, a centesimal system proceeds to the number 10,000 before establishing a new unit reference (i.e., “100 hundreds”). Thus the number 3254, which in a decimal system is 3 thousands — 2 hundreds — 5 tens — 4 ones, in a centesimal system becomes 32 hundreds—54 ones, and would be only two digits when written (the single character representing 32, and the single character representing 54). The details of writing Ithkuil numerals are given below in Section 12.5. While the above may seem unwieldy or even arbitrary, it actually parallels Western base-ten numerals in terms of its systematization. For example, in a Western number like 456,321,777,123, each set of three numbers between the commas tells how many hundreds there are of a certain power of 1000 (i.e., there are 123 of 10000, 777 of 10001, 321 of 10002, and 456 of 10003, or in more common terms 123 ones, 777 thousands, 321 millions, 456 billions). The same exact system holds for Ithkuil, except that the sets of numbers “between the commas” so to speak, is the number of ten-thousands, not thousands. Thus, if we were to rewrite the Western number 456,321,777,123 in such a system, it would be 4563,2177,7123 (i.e., 7123 of 100000, 2177 of 100001, and 4563 of 100002, that being 7123 ones, 2177 ten-thousands, and 4563 hundred-millions). The semantic roots for numbers in Ithkuil from 1 to 99 are based on roots for 1 through 10, to which the nine degrees of the Slot XI derivational affix -Vk are added. Each of the nine degrees of this suffix, when applied to one of the ten number-roots, corresponds to an additional multiple of ten. This is illustrated in Table 64 below. The addition of a particular degree of this affix to one of the ten indicates that the root number is added to that multiple of ten. For example, the stem ksal ‘two,’ plus the seventh degree affix -Vk/7, gives ksalok ‘seventy-two.’ Because there is no root corresponding to ‘zero’ (see Sec. 12.3 below), each multiple of ten is constructed using stem mřal ‘ten’ plus one of the above suffixes. Thus, the numbers 20, 30 and 40 are respectively mřalik, mřalök and mřalek, but the numbers 22, 32 and 42 are ksalök, ksalek, and ksalîk. This pattern only operates up to the nineties, as there is a separate autonomous root for 100, -ň-. Ithkuil has no word for “zero” nor is it conceptualized as a numerical category. Instead any appropriate formative may take the PTW suffix in first-degree -iss ‘no amount of’ or the EXN suffix in first-degree -ib ‘no…at all’ in terms of degree or extent to create negative expressions that convey the idea of an absence of a numerical entity or quantity. In many cases, simply the negative of whatever formative is under discussion may be used. As for handling the concept of zero as a null placeholder when writing Ithkuil numbers, this is addressed in Section 12.4 below. Ithkuil does not employ a symbol for zero. Instead, Ithkuil employs separate autonomous symbols for each power of 100 (100, 10,000, 100 million, etc.) each of which operates as the appropriate placeholder instead of zero. To illustrate what this means by analogy, pretend that “@” is an autonomous symbol for 27 (since Ithkuil numbers from 1 to 99 each have a separate symbol), “&” is a symbol for 100, “#” is a symbol for 10,000 and there is no symbol 0 (zero). The numbers 2700, 2705, 327, 22700 and 4,270,027 would then be written @&, @5, 3@, 2@&, and 4@#@ respectively. (NOTE: In actual practice, numbers which contain the “hundred” symbol, here represented as “&,” normally place a dot above or below the adjacent numeral and dispense with the &, indicating that the number so marked is to be multiplied by 100. Since Ithkuil is a base-100 system, numbers do not become two digits in length until the hundreds, do not become three digits in length until the ten thousands, do not become four digits in length until the millions, etc. One must also remember that in terms of left-to-right orientation, numbers follow the boustrophedon mode the same as the Ithkuil script (see Sec. 11.3.2). Similarly to Western languages, small non-compound numbers can be written using either their numerical symbols or written out in script (as in English “12” versus “twelve”). The following table gives the Ithkuil numerical symbols along with their morphological stems. The symbols for 11 through 99 consist of the symbols for 1 through 9 plus various extensions added to their lower left “trailing” line indicating the particular 10-group to be added. Spoken numbers are formed from the above stems using both the PARTITIVE and COMITATIVE cases, as well as using the coordinative affix -Vň/1 (= -iň). The number of largest base units is shown by placing the base-unit term in the PARTITIVE. If this is then followed by another collection of smaller base units, that number of smaller base units is connected using the COMITATIVE case while the smaller base-unit term is again in the PARTITIVE. Single units (from 1 to 99) are connected by the coordinative affix when they are part of the number of hundreds or higher base-units. 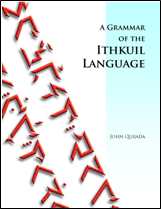 It should be noted that when pronouncing numbers greater than 199, it is normal in Ithkuil to omit the word ňial (= the PARTITIVE of ňal ‘one hundred’) referring to the number of hundreds. This is equivalent to the custom in colloquial English of saying ‘three twelve’ for ‘three hundred (and) twelve.’ The difference is that in Ithkuil, this omission of the word for ‘hundred’ is the preferred option, the word ňial being used only in larger numbers for clarity’s sake. Lastly, when numbers comprising multiple number-stems are declined for case, configuration, extension, etc., rather than writing out the entire number “long-hand,” the number symbol is used, preceded by the carrier stem ep- (see Sec. 9.3) which carries the appropriate declensions. This use of the carrier stem applies even to single-stemmed numbers when writing, in order to allow use of the number symbol instead of writing it out. In such cases involving single-stemmed numbers, the carrier stem is not pronounced (rather, the numerical stem bears the pronounced declensions); it is there only as a written indicator of the morphological declensions/derivations to be applied to the number stem.